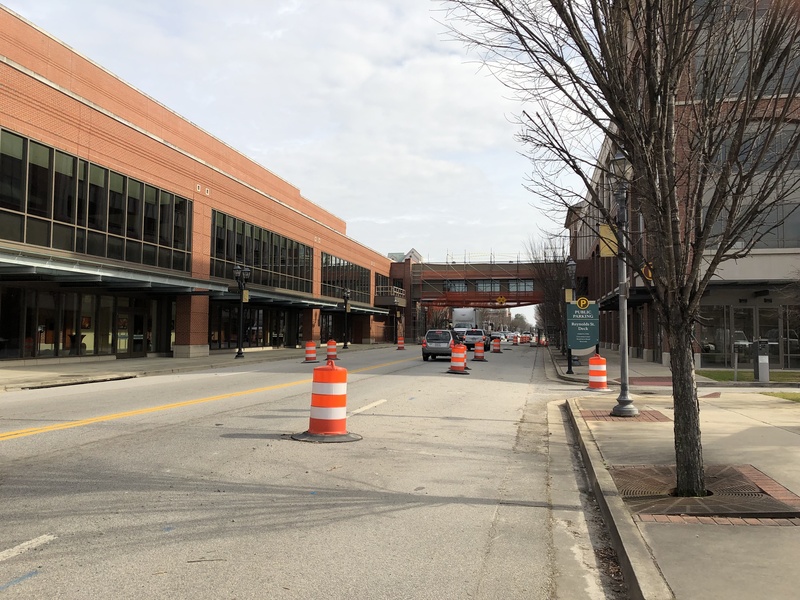 Construction of a long-awaited pedestrian walkway over Reynolds Street linking the city convention center to its parking deck has begun, and city officials say the street might need to be closed as many as five times during the next four months. Specific closure dates are dependent on the weather and progress of construction on the $1.2 million project, but the first of the closings could occur in two to three weeks, said Takiyah Douse, head of the city’s Central Services Department. Reynolds’ curbside lanes already have been blocked with construction cones to allow workers to begin preparing the convention center’s second floor and for the elevated and enclosed walkway that will connect it with the parking deck’s second level. On days when the street is fully closed, east-west traffic on Reynolds Street will be detoured south around the block, Douse said. The deck will remain in operation during construction but sidewalks along Reynolds might be intermittently closed depending on construction activity. The walkway’s purpose is to provide a climate-controlled path from the parking deck to the 115,000-square-foot Augusta Convention Center facility, which was tied into the Augusta Marriott at the Convention Center complex in 2012. The elevated walkway will reduce the need for conventioneers, visitors and others using the Marriott complex to cross at the street level. “It’s a safety feature,” Douse said. The pedestrian bridge also will feature electronic signage that can be used to promote events at the facility and throughout downtown, she said. The Augusta Marriott’s owner, Augusta Riverfront LLC, which operates the convention facilities under a contract with the city, had sought the walkway’s construction since the Augusta Convention Center expansion opened five years ago. The walkway’s contractor, R.W. Allen, is the same company that built the convent center addition, which is primarily used for trade shows, exhibition space and large gatherings.